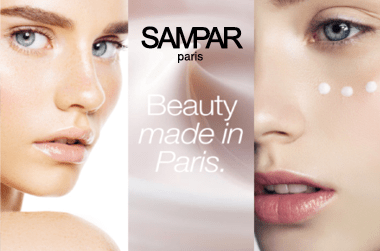 &apos;Beauty cannot wait’, the philosophy that French skincare brand SAMPAR live by. Founder Patrick Sounigo combined his medical studies with his passion for cosmetology and developed a skincare range that promised both immediate visible results and long-term clinically proven efficacy. Patrick then teamed up with Antoine Bouillot, a talented designer who brought her creative flair to SAMPAR, and together they built an authentic brand that instilled unparalleled elegance with result-based skincare based on the lifestyle of Parisian women. Each unique SAMPAR French-made formula contains the exclusive complex, Urban Advance, which comprises of three key ingredients: Mint Endorphin to soothe skin, Probiotic Sugar to revitalise and Shea Butter Serum to protect. Skin can be damaged by a multitude of factors, some of which include ageing, environmental damage, and external and internal aggressors, which leaves skin imbalanced and not functioning at its full potential. SAMPAR was created for women seeking smart skincare products, with ground-breaking formulas that are designed to get skin back to a balanced and healthy state. On top of smart formulas, SAMPAR also utilises smart packaging with an airless system that works to preserve the integrity of formulas, preventing bacteria from forming, and allowing for no product loss. Targeting the &apos;impossible&apos;, SAMPAR has two products within their range called The Impossible C-Rum and The Impossible Eye Cream that work to slow the skin-aging process and recover the look of youth. The 5-in-1 face serum works to the simultaneously firm skin, reduce wrinkles, hydrate, reduce the appearance of dark spots and promote radiance. Containing SAMPAR&apos;s exclusive Skin Youth Reverse Peptide, this serum works to smooth fine lines and deep wrinkles with continued use. The powerful SAMPAR Impossible Eye Cream will eliminate signs of fatigue while slowing the aging process to revive a youthful eye area. 45% of this advanced formula is made up of concentrated actives that instantly illuminate and lift the eye contour while targeting signs of aging. As SAMPAR states, beauty cannot wait, so get your hands on some SAMPAR today. Not the oil for me, but beautiful smell! I love using oils, and was given this as a gift by someone who knows how much I love darphin’s luxe 8 flower nectar oil. This smells just as divine! Definitely a treat. In terms of skin conditioning prowess I think there are more affordable oils out there that do the job just as well, and this isn’t good for me when my skin is inflamed or red (it exacerbated my redness during a recent flare up). A lovely option for someone with non-sensitive skin.